2012-13 Score Hockey sees the return of the venerable value-laden early release aimed at set builders, those on a budget and hockey fans starved for a preview of the forthcoming season. Boasting several inserts, random inserts and a clean base set, 2012-13 Score Hockey touches on the brand's roots while offering some new spins. 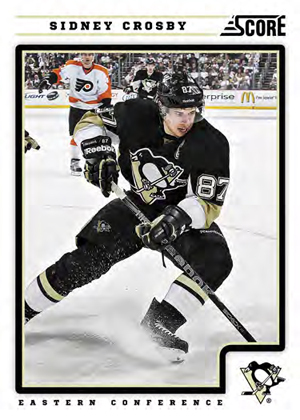 The 2012-13 Score base set features crisp white borders. They leave lots of space for an action photo in the middle of the card front. Player info includes name, team logo and their conference. Position is absent. 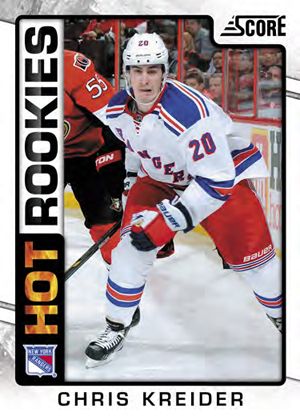 Hot Rookies is a short-printed subset highlighting players who debuted late in the 2011-12 season. An added background and flaming font make these rookie cards a lot more lively than the regular base cards. Inserted one per pack, Gold Rush parallels have a hint of color along the sides of the borders. Hot Rookies Gold Rush cards fall one per box. Although 2012-13 Score Hockey is a low-end release, that doesn't mean its completely without hits. 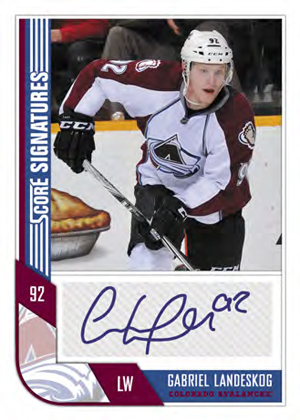 Score Signatures don't fall one per box, but they should be plentiful enough to satisfy cardboard treasure hunters and provide a bonus for pack busters. 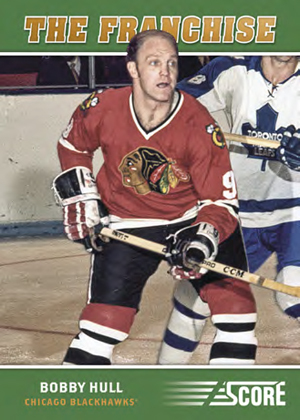 The Franchise Retro is a retail-exclusive set that looks back on the NHL's all-time greats from Original Six teams. The green borders are reminiscent of the similar 1992 Score Baseball insert set with Mickey Mantle, Carl Yastrzemski and Stan Musial. The Franchise Retro cards fall three per retail box. 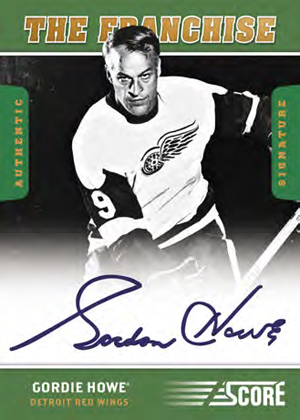 Collectors can also look for The Franchise Retro Autographs from the likes of Gordie Howe and Bobby Hull. 2012-13 Score NHL Hockey Blaster Box - Look for AUTOGRAPH ! JOHNNY BOWER SIGNED 12-13 SCORE TORONTO MAPLE LEAFS CARD AUTOGRAPH AUTO! BOBBY HULL SIGNED 12-13 SCORE CHICAGO BLACKHAWKS CARD AUTOGRAPH AUTO "HOF"!!! Why would you expect lots of hits from a dollar per pack product? Compared to the lone baseball dollar per pack product (topps opening day, which features one auto per case with small name players only, and mostly-terrible inserts) this is a five-star product. A parallel in every pack, lots of rookies, a great autograph checklist…you get your money’s worth every time. Got a box and it is ok. 3 stars. I am a set builder, but are going for OPC. But for a dollar per pack it is a good deal. At a dollar a pack there is no way you can go wrong, love this low end product and some of these insert cards are bringing big $$$ on eBay if you get the right ones! Fun for anyones price limit.. Overall I give it a 4 star because the chances are hard to pull a real gem but the price is like the good old days! 5 stars – I love the score product and i think its a great buy for collectors especially when you can’t always afford the higher priced hobby products , And i think it’s also a great buy for kids , I love the inserts and i love the autographs , I love the parallels which makes building sets a little more exciting , Last years score featured the ” Glossy Parallels ” in their base sets , And this year they are featuring the ” Gold ” Parallels in the base sets , And i think that is awesome for people who build and collect sets , And i also have to say i have never gone wrong buying packs of score , I always get my money back when i purchase packs of score , Either through the rookie’s / SP rookies / Net Cams / Or other inserts , And i also have to mention that i have bought only a couple packs at a time and there have been times where i have pulled autographs though only buying one or two packs at a time , So i think the score product is an amazing buy , and an amazing value for your dollar ! How can you go wrong when you get 252 cards for $25 If you are looking for cards for your son/daughter so s/he can actually touch and play with them, this is a great choice. My son loves to take them with him to the Toronto Marlies games and try to get his favourite players to sign them. It’s also not bad that you can still open up a super insert like an autographed card. I haven’t collected hockey cards in many, many years but saw this product on a shelf at Wal-Mart along with some other brand that had Crosby on it. Because this was $10 cheaper for a box, I opted for this and i’m glad I did. I like the way the cards look, I like the inserts that i’ve found and I look forward to trying to collect the entire set. I also love that this isn’t a hobby that will kill my bank account. Has anyone else noticed the Niklas Kronwall (no 179) card has a picture of Tomas Holmstrom on it? As a Red Wings fan, I’m a little ticked about that. Love the product. Nice affordable card set. Very fun to collect. Just wondered why the box set I bought has a double card of a player in each pac in all eleven packs in the box set. The double cards are the same except the border on one is white and the other is grey-gold. Anyone know why. Brian � Each pack has a “Gold Rush” parallel – each card is the same but with the different colored border. Some like the added challenge of chasing a set of them. This 2012-13 score set is the best to date, I have bought probably about 10 11 pack boxes and 6 36 pack boxes and I got all the Original six Franchise, two autographs, two check-it cards, a couple gold hot rookies and tons of other good cards, I cant wait to start collecting the 2013-14 set. I can say this set pulled me back in to collecting. I got away from card collecting due to everything being about inserts and to be honest I never felt the urge to spend more than $2-$3 a pack. At Thanksgiving the local cardstore had these in the 11 pack boxes at the deal price of $3.96 a box! YOu couldn’t go wrong with that. I’ve bought 20 as of now and may go back and finish off their supply. I pulled a handful of gold rush, a complete original 6 subset, and numerous franchise and other chase cards. I’m in it for the set not the chase, but at this price how can you not get excited! Very good product. Lots of sub sets and you get the proper feeling of how a hit should be for a buck. That being said jaden Schwartz time for a hof career. Happy hunting! 2012 13 Score NHL Hockey Factory Sealed 20 Box CASE !!! Rookie in Every Pack !